With 28 years of experience, Steve Ziegler, owner of 3D Landscape Design, can design a plan to make a home, business or park come alive with plants, trees, shrubs and night lighting perfect for the climate of the project. Ziegler’s talents and skills also include irrigation design planning to meet the specific needs and wishes of his clients. With his motto and mission being, “a friend in your back yard,” Ziegler, enjoys working one-on-one with a client to achieve the perfect look for any project. “My true love for landscaping is creating a style to fit the neighborhood and location,” Ziegler said. He has worked at the coast, in the woods, at the lake or on islands. Ziegler developed an interest in landscape when he delivered newspapers in Presque Isle, at the age of ten. “I was very organized. I helped my newspaper customers in the summer by helping with mowing, gardening and in the winter, shoveling,” Ziegler said. He admits that he’s done a lot of jobs, some with national figures, and was in the Army in Vietnam, but each time he stepped away, he returned to his passion for landscapes and design. Ziegler spent a lot of time watching DIY shows on landscape design and eventually got to know Gary Alan of “The Designers Landscape” very well. “I can’t look at a home or business without landscaping it,” he said. He is the only designer in Maine who does this type of landscape design, he said. He can use a CAD system, but “this just takes you there,” he said of his methods. With technology, Ziegler can show a customer the finished project down to the details of day or night, or different seasons. They will know what the design will look like for their home using photos that Ziegler takes. He can change the color of the house, add shutters or boulders without the expense of doing the project only to discover that it was completely wrong. He likes to present plans with year-round color. “Evergreens, shrubs and trees are added so they don’t have to see a barren landscape in winter,” he said. He has no limitations. He adds in stones, fences or water features and can easily remove them if a customer wishes to see something different. He prefers to work with circles and curves and doesn’t use a lot of straight lines in his designs. The clients receive plans and pictures, and in the portfolios, they also receive information on the various plans that were used in the design, how to care for them and their Latin names. “They get educated and interested in their design,” Ziegler said. The 3D Landscape Design plans are great for developing curb appeal when selling a house or when looking for more outside living area. He can add hardscape into designs like patios and pergolas. He works with builders to complete a home’s exterior while the interior is being perfected. “You don’t think about the landscaping when you build a house. We get it all done before you move in,” he said. The plans give a client an idea of what the landscaping will look like at maturity. “I can be very specific to the needs of the customer,” he said. He can work with any company a client chooses. 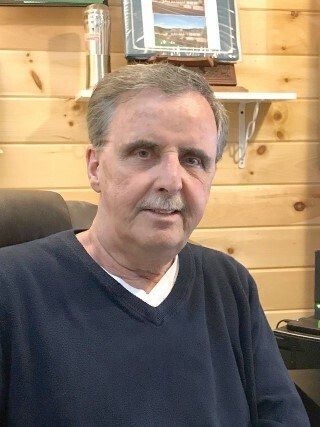 In the Windham, Raymond area he has companies he works with on a regular basis. The contractors get the pictures of the project so they know exactly how things should look when they are complete. This is the perfect time to make a plan with 3D Landscape Design and get plants in the ground. “I’m a good listener, which creates the best outcome for customers. I can help couples come together to make decisions,” he said. Design fees start at $300. Ziegler offers free consultations. 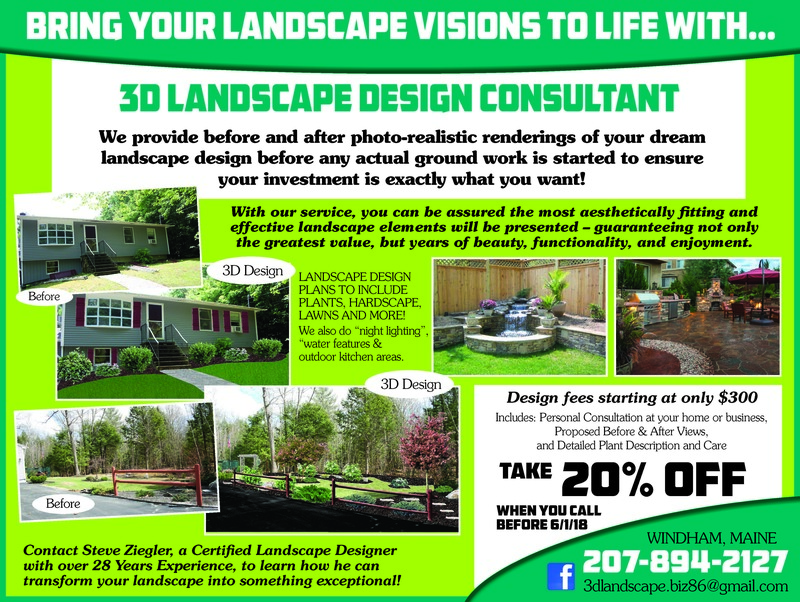 For more information, find 3D Landscapes Design on Facebook, call 894-2127 or email 3DLandscape.biz86@gmail.com.